In the southern reaches of the Richtersveld semi-desert, you will come to the lovely little town of Eksteenfontein. Named after the Reverend Eksteen who did much to assist the plight of a group of people originally from Bushmanland called the �Basters�, the town was named in his honour. The �fontein� part of this name comes from a historical fountain in the town, legacy of an ancient, verdant past. The fountain and the Stinkrivier nearby are surrounded by endless stories told by local elders, of battles and mysticism, and are certainly worth a visit. It is impossible not to feel harmonious in this gentle village, despite the summer heat. Eksteenfontein exhibits a welcoming softness and friendliness that is typical of the Richtersveld. The geological features here seem more rounded and less stark than in the more northern regions. 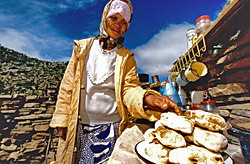 The people of Eksteenfontein are mostly farmers that keep livestock such as goats, sheep, cattle and poultry. Nature is truly spectacular here, and there is much to learn about the flora, medicinal plants and wildlife�on bird and plant finding expeditions, walks or donkey cart rides. There are also curios, local textiles, woodwork and needlework projects, and artefacts, and, of course, stories that can be heard first hand from colourful characters in the town. Under the open skies in and around Eksteenfontein, the traditional food and freshly baked breads (the famed �rooster brood�) made in open fire are inviting. On the Red Mountain, or Rooiberg, the air is so pure and invigorating that it seems to permeate one�s every pore. In this part of the Richtersveld one will come across some fascinating cultural sites such as rock engravings and San graves. The mountains are home to the protected Halfmens trees and the endangered Baster Quiver Trees. Rooiberg also hosts a research station. Stargazers will be absolutely spellbound at the clarity of the night skies and will find it very difficult to leave. Textile group: A needlework (lappies) group producing and selling hand-made garments with Richtersveld motives. Town tour hiking trail: A tour, by pipe car or hiking, unveiling historical graves and traditional stock posts. 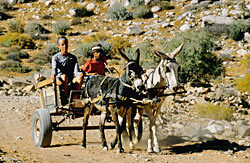 Donkey cart riding: A ride in a donkey cart along the route from town to Rooiberg (the Red Mountain).